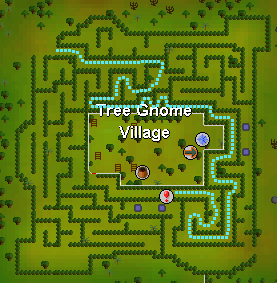 Speak with Bolren in the Centre of the Tree Gnome Maze. Ability to defeat Khazard Warlord (Level 112). 6 normal logs (or a Woodcutting axe). Skills: 50+ Combat, 50 Defence or 43+ Prayer. 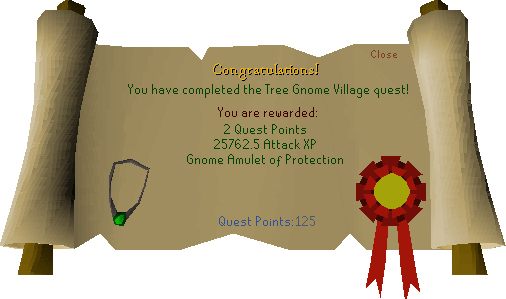 Item: Armour (Rune or better), Weapon (Dragon or better), Food (15-20 Lobsters or better). Speak with King Bolren in the center of the Tree Gnome Maze. The maze is actually very easy to enter, just watch out for the dead-ends (refer to the map above for the correct path but do not go downstairs, keep moving forward). Choose the options 'Can I help at all?' and 'I would be glad to help' to begin the quest. Elkoy will automatically lead you out of the maze. Now go north until you find Commander Montai. Talk to him and offer to collect wood for him. Talk to him again and you will automatically hand over the six ordinary logs that you brought with you. Talk to him for the third time and volunteer to help him with the co-ordinates. Head north-west from Commander Montai, past the wooden bridge, and talk to Tracker gnome 3. He tells you the 'X' co-ordinate in a riddle. The riddle is different for each person, and can be from 1 to 4. Now go to the north-east of the Khazard Battlefield. In a small octagonal building another gnome is being held captive. He will tell you his co-ordinate. Behind the biggest building in the Khazard half of the battlefield is the third and final undercover gnome. He will tell you his co-ordinate, the final one assuming you've talked to the other two gnomes. Choose some random value between 1 to 4, If you choose correctly it will tell you that you fired and it hit the Khazard Stronghold. Go over to the Khazard part of the battlefield. Select 'climb-over crumbling wall' for the building where the Khazard Commander (Level-48) is. Climb the ladder in the corner of the room and kill him if you want. Both will only drop bones. Return to Elkoy and he will lead you to King Bolren. King Bolren has bad news - Khazard troops slaughtered many gnomes last night, they also took the other two orbs. You volunteer to retrieve them for him and Elkoy 'teleports' you out again. Go north-west of the Khazard battlefield area past the Wolves (Level-64). Walk past the Khazard Troopers (Level-19) located near him. Attack the Khazard Warlord (Level-112). He is actually very weak and it shouldn't be very difficult for a level 60+. On his death the two remaining orbs appear as one item in your inventory automatically. Maging and ranging works well when fighting the Khazard Warlord as he has a small wander zone. Bringing potions, using prayer and special attacks in the battle may help you. Return to Elkoy and he will lead you to the centre of the maze. Talk to King Bolren, he will personally congratulate you and then a ceremony will commence.